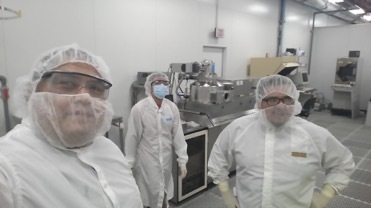 The REU team of Navajo Technical University students in the cleanroom of the Solar Power Lab in 2016. One of the 2018 REU students performing a lithography step in the ASU NanoFab as part of the process to fabricate a nanoscale silicon membrane. Teachers participating in the 2018 RET program use a scanning electron microscope to image device structures at the micro- and nanoscale. 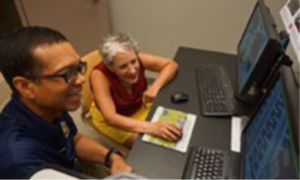 The NCI-SW offers multi-week summer research programs at Arizona State University (ASU) for undergraduates as well as K-12 and community college STEM teachers. Participants selected for these programs gain new skills and valuable experiences working with nationally recognized scholars in mirco- and nanotechnology research and leaders in science education. Program highlights from previous summers are described below. The application procedure for the 2019 Research Experience for Undergraduates program are now available. Click here for details. Information for the Teachers program will be posted when it becomes available. The NCI-SW selected four students from a group of well qualified applicants for its 2018 Research Experiences for Undergraduates (REU) program. The participants were all from regional community colleges, and included one Hispanic and two female students. This continues the NCI-SW’s efforts to recruit and retain a diverse population for its programs. These REU students paired up to form two teams to research different device applications at the micro- and nanoscale. 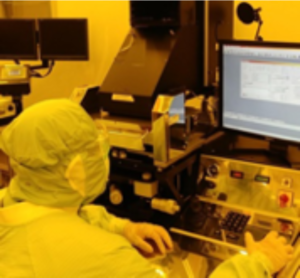 One project studied how a nanoscale transistor can be used as an on-chip temperature sensor to monitor device self-heating and the effect on performance. The other project studied the fabrication of a nanoscale silicon membrane that can provide a platform to build an electron diffraction grating for use in a novel compact source of hard x-rays. Upon the completion of their projects, the students presented their results in poster sessions at the NNCI REU Convocation in Charlotte, NC. 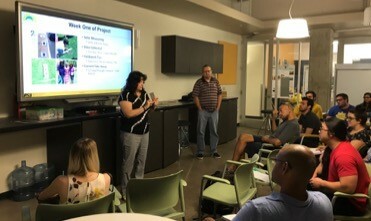 Two instructors from local community colleges (Phoenix College and South Mountain College) participated in NCI-SW's Research Experiences for Teachers (RET) program. They were introduced to cleanroom operation and safety procedures in the NanoFab as well as the use of characterization methods such as scanning electron microscopy. The experience allowed them to develop methods and curriculum that can be used to teach the subject of Scaling as it pertains to micro- and nanotechnologies at their home institutions. 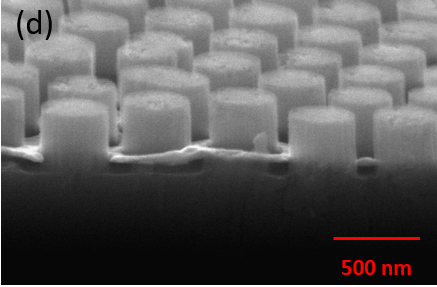 A scanning electron microscope image showing an array of silicon nanoscale pillars fabricated by one of the research teams in the 2017 REU Program. Four students participated in the NCI-SW Research Experiences for Undergraduates (REU) program during the summer of 2017. These participants included two veterans and one female, and all were from regional community colleges. They were selected from a group of well qualified applicants with the aim of addressing one of the NCI-SW’s goals to recruit and retain a diverse population. These REU students paired up to form two teams to investigate different micro- and nanoscale techniques to improve the performance of silicon solar cells. These were collaborative projects between ASU’s NanoFab and the Solar Power Lab. One project aims to create small pyramidal features on the cell surface, while the other studied the fabrication of arrays of nanoscale pillars. Upon the completion of their projects, the students presented their results in poster sessions at the NNCI REU Convocation in Atlanta, GA and the Arizona Student Energy Conference in Tempe, AZ. 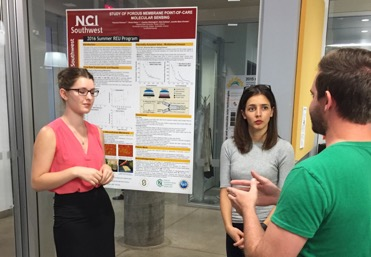 The team of Scottsdale Community College students explaining their research results during the Poster Presentation Event at the conclusion of the 2016 REU Program. Dr. Kyle Rawlings from Scottsdale Community College getting his RET Certificate from ASU Faculty Mentor, Dr. Jennifer Blain Christen. In 2017, NCI-SW’s Research Experiences for Teachers (RET) program hosted a 5th grade teacher from St. John Bosco School located in Phoenix, AZ. 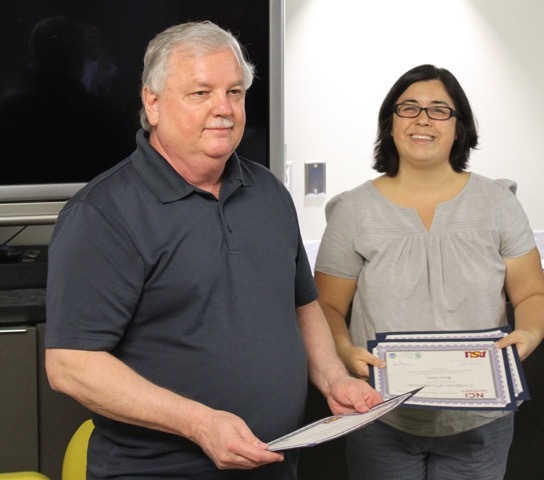 She teamed up with other participants in a concurrent RET program conducted by the Engineering Research Center for Quantum Energy and Sustainable Solar Technologies to collaboratively develop methods, hands-on activities, and curriculum that can be used to teach solar cell and related technologies back at their home institutions. Five students participated in the NCI-SW Research Experiences for Undergraduates (REU) program during the summer of 2016. They were selected from a group of well qualified applicants with the aim of addressing one of the NCI-SW’s goals to recruit and retain a diverse population. Three of the five students are Native Americans from the Navajo Technical University in Crownpoint, NM. They worked as a team on a collaborative project between the Solar Power Lab and the ASU NanoFab to investigate processing techniques to improve the performance of silicon solar cells. Upon the completion of their project, they presented their results in a poster session at the Workshop on Crystalline Silicon Solar Cells and Modules: Materials and Processes held in Vail, CO. The other two are female students from Scottsdale Community College, AZ. They worked on a project that explored techniques to build low-cost biosensors for disease detection. This effort required an interdisciplinary approach that utilized different aspects of engineering and biochemistry. The team’s findings provided valuable information for this feasibility study. In 2016, there was only one participant in NCI-SW’s Research Experiences for Teachers (RET) program. He is a faculty member from Scottsdale Community College, the same school for 2 of the REU students. He also worked on a biotechnology related project that investigated the use of 3-D printing, in close proximity to those students. This cohort approach is viewed as a potentially more effective way of bringing a research culture and new curriculum topics back to the participants’ home institutions.